Summertime and fresh cocktails go hand in hand. The perfect warm weather beverages should be cool, crisp, and refreshing. Vodka is one of the most popular alcohol bases for summer drinks as it pairs so well with seasonal flavors, herbs, and spices. As a result, we have put together this list of the best summer vodka cocktails of 2017. The quintessential summer flavors like fresh fruits like berries, watermelon, and lemons are must haves to take your cocktail recipes to the next level. Mix seasonal fruits with fresh herbs and you’ve mastered the perfect summer cocktail. Perhaps you can even come up with a new cocktail recipe that will make next year’s list of the best summer vodka cocktails! Warm weather months always seems to come and go so quickly, there is no better time to experiment with these cocktail recipes and truly elevate your summer experience! 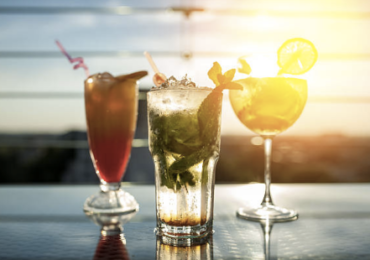 The top five classic summer cocktails are perfect for casual afternoons on the patio or large parties. These recipes bear no gimmicks or complex ingredients that are nearly impossible to find. Classic combinations and accessible ingredients allow for timeless cocktails. Squeeze lime into glass (or copper mug). Add in lime peel. Fill glass with vodka, and add cold ginger beer to taste. Stir and enjoy. Try adding mashed strawberries with the lime for a refreshing summer twist on this classic cocktail. *We also highly recommend our own Muddled Fig Moscow Mule as an alternative to the traditional recipe found on this best summer vodka cocktails list. Neutral vodka pairs wonderfully with fresh watermelon, and with a touch of honey there is a perfect hint of sweetness. This drink is guaranteed to quench your thirst on a sunny day. Additional fresh herbs like mint or basil will add another level of complexity that is sure to impress your guests and keep them coming back for more. Add fresh watermelon, lime, honey, and water to a blender. Mix until pureed and frothy. Pour mixture through a fine strainer to remove pulp and seeds. Combine vodka and herbs. Stir well. Pour over ice, garnish with watermelon wedge and herbs. This beautiful spritzer is easy to make and sure to be a crowd pleaser. Fresh lavender combined with blueberries reveals an incredibly satisfying happy hour beverage. This is a summer drink your guests won’t soon forget! Tip: Make the simple syrup ahead of time and your prep work will be a breeze! Simple syrup: Combine water, blueberries, and sugar in a pan, and bring to boil over medium heat. Stir constantly until sugar dissolves. Simmer syrup on low and add lavender. Continue to simmer for 10 minutes. Strain and pour into jar, squeezing remaining juice from berries. Combine vodka, simple syrup, club soda, and lime into a large pitcher. Add ice and a few handfuls of blueberries. Pour over ice, garnishing with lavender and blueberries. Cucumber is a perfectly hydrating and refreshing snack in the summertime. Paired with fresh lime and mint, this cocktail is sure to be a drink that will cater to all your guest’s needs. This is a sophisticated tasting cocktail that is not overly sweet, so it is sure to satisfy every cocktail enthusiast. Summer just isn’t the same if you don’t get to enjoy a cold pitcher of fresh lemonade! Lemonade is a timeless beverage that will be a hit at your next summer patio party. Just like mint and basil, thyme is another characteristic summer herb that adds a wonderful flavor dimension to cocktails. This cocktail not only looks classy, but it tastes delicious. This cocktail recipe is a guaranteed crowd pleaser! Lemonade: Combine all ingredients and stir well. Will store for over a week refrigerated. Simple syrup: Combine sugar and water in saucepan over medium heat, stirring consistently until boiling. Add thyme and simmer another 2 minutes. Remove from heat to cool with thyme in the pan. Once cool, strain and store in the refrigerator. To make the cocktail, pour vodka, lemonade, and simple syrup over ice. Garnish with sprig of thyme and a wedge of lemon. There is no question that vodka is the most versatile and mixable liquor in the bar. Vodka’s clean and neutral taste pairs wonderfully with sweet, spicy, and savory cocktails. For refreshing summer drinks, vodka is a must have base for light and fresh flavors that appeal to any crowd. Whether you are just beginning your journey as a casual mixologist, or you are a cocktail connoisseur behind the bar, these summer cocktails are must-haves in your recipe arsenal. Use the summer season to your advantage and try these highly recommended cocktails that are easy to make, have an impressive aesthetic, and an unforgettably refreshing flavor. In conclusion, we hope that you enjoy all 5 of our best summer vodka cocktails of 2017!